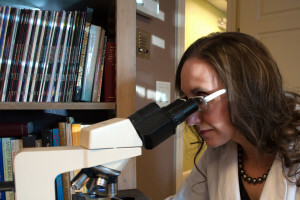 Mohs Micrographic Surgery is a specialized, highly effective technique used to remove skin cancers that are highly aggressive or that occur on the face, ears, scalp, or arms. It differs from other skin cancer treatments like excisions because it ensures the most immediate and complete microscopic examination of the removed cancerous tissue. In other words, rather than having your skin cancer removed, and having to wait a week or two to find out if the area was completely cleared of tumor cells, Mohs allows Dr. Lamerson to examine the removed tissue while you wait, so that you can all be sure there are no remnants or ‘roots’ of cancer cells still left. Once she determines the cancer has been thoroughly removed, the site can be closed. This procedure is recognized as having the highest reported cure rate among skin cancer treatments. Dr. Lamerson has performed thousands of Mohs procedures over the last 20 years and is a Fellow of the American Society for Mohs Surgery.